Well, maybe your students won't ACTUALLY be eating rocks! But they will get to move through millions of years as they hear a story about how sedimentary rock is formed, and make their own "rock" from peanut butter and jelly. I have used this activity for years, but I always had to change it. To my shock (read horror) every resource about “Peanut Butter and Jelly Geology” that I found said that students should “Make their sandwich any way they choose”. I don’t think so! I had already spent over $10 for supplies, I wanted to squeeze out any bit of learning I could from this activity. So, I made up a story that I read to students as they follow along. Students move through millions of years to see how sedimentary rocks are formed, how fossils get into rocks, and how layer after layer presses down to form a rock. Once the sedimentary rock (sandwich) is finished, the story continues as students cut their sandwich in half and learn about fault lines as they follow another 350 years of earthquake activity. 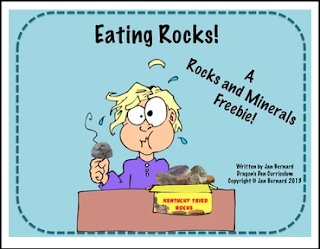 Rocks and Minerals: Task Cards and More! To receive updates on new products, and receive 1/2 off during the first 48 hours of launch, click on the "follow me" button next to the green star!